Imagine coming upon an old fashioned bee skep perched between cottage blossoms, with honeybees buzzing about to collect the nectar. Well, I once imagined this scene, and now I have reseeded the garden to bloom with foxgloves and cosmos, and two brand new sentiments. Share this one with your sweetest friends! Or just color it up for the sheer joy of it. 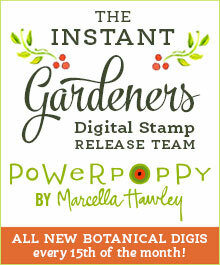 Be sure to stop by and visit the rest of the Instant Gardeners for some inspiration. Items marked with an asterisk (*) were provided by a store or the manufacturer. All other items were personally purchased. Nancy, this is so adorable! I just love your image beautifully colored with the added texture in the background, and I always love gingham DP! And the sweet little Jolee’s bee finishes it off perfectly! Beautifully done, sweet friend! Hugs! Such a sweet new image this is and you’ve colored it beautifully. The gingham is simply perfect with it and the embossed background makes me think of bees buzzing around the garden. Oh, and that little bee embellie is the cutest thing! This sentiment from Bees in Foxglove makes a great companion. Love it all! Beautifully done – thanks for sharing!!! Love all things gingham, so you had me right away! I adore your card, Nancy! Your coloring is supberb. I especially like how you colored the skep…soooo beautiful! And, of course, I LOVE the bitty bee embellishment! Its so charming! So beautiful Nancy. I love the circle panel. This card just makes me smile. Just gorgeous, love love love the card, the colors you chose, the subject. So summer. Beautiful colouring, love the embossing and gingham paper and that bee on the sentiment is adorable!!! Love it all!! Subscribe and be the first to know each time there is a new project or class! As a result of participating in design teams, I currently receive or have received products that I promote and endorse for free or at a discount. I also participate in affiliate programs which means that I received a commission at no cost to you when you make a purchase through an affiliate link on this website. This helps to support the cost of maintaining this website. I am not paid by any of these companies to use their products and should this ever happen, I will disclose that in a specific post. I will never share or recommend a product that I do not like or would not personally use. Period. See Disclosure for additional information.